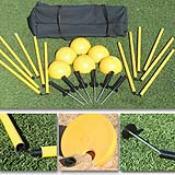 Indoor/Outdoor agility pole system, Train athleties to make sharp cuts ^ reduce reaction time & improve agility. Includes carry bag. Train athletes to make sharp cuts while maintiaining proper form, posture & position. Help reduce reaction time, while improving agility and speed on the field or in the gym. Complete set includes six 2-piece, 60" PVC poles that break down for easy storage along with 6 spring-loaded spikes for outdoor use and 6 domed bases for drills indoors or on artificial turf. Bases can be weighted with stand for extra stability. Convenient carry bag keeps it all in one place for easy transport to and from practice.